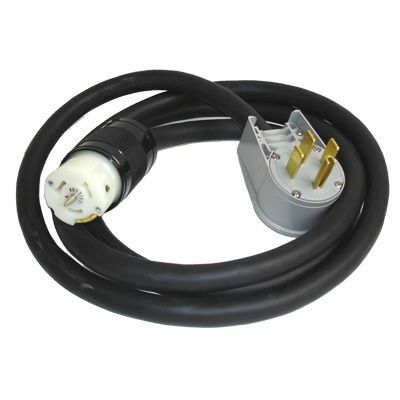 50 ft. 50 amp Generator Cord with NEMA 14-50 Male and Locking Female Our heavy duty, all rubber power cords are the connecting link between the generator and a transfer switch via a power inlet box. All rubber cord stays flexible even in subzero temperatures. 50 ft. cord, 4 conductor, 6-Gauge wire with 50 Amp male (1450) + female (CS6364) ends. Made from UL Listed components. 50 ft. 50 amp Generator Cord with NEMA 14-50 Male and Locking Female is rated 4.8 out of 5 by 6. Rated 5 out of 5 by RLS from Very happy with the quality of the cord. Have not... Very happy with the quality of the cord. Have not used it as of yet so I guess that's a good thing. Sure it will work fine when needed. Rated 4 out of 5 by mike from I think this is a bit over priced for what it is. Plugs are very high quality wire is heavy jacketed water rated. Price I think is a bit high but the price of copper being what it is . I guess it is what it is. Rated 5 out of 5 by gman19511 from 50ft 50amp gen cord Great quality very fast shipping received cord faster than ordering factory direct. Can I use this 50 amp cable with a 40 amp Generlink? No, you will need to match the amperage in order for the cable to be effective.